During wartime, naval architects usually continue drawing new warships, even when economic prioritization means that they cannot possibly be built before the conflict. That was particularly true in Germany during both world wars, both to maintain the office’s steady funding (the goal of all government agencies, military or civilian) and to keep the younger staff members out of the draft pool. Great War at Sea: Jutland 1919 looks at the battleships and cruisers designed during the last years of the First World War, in both Germany and Britain. It’s very much a companion piece to High Seas Fleet, which studied the sort of fleet that Germany could have built had it actually taken the so-called “Dreadnought Race” seriously, and included ships designed before the First World War, but not constructed. Jutland 1919 carries on that theme, but this time with the ship designs that followed those seen in High Seas Fleet and those actually built and appearing in our Jutland game. There are 60 new “long” ship pieces (45 German and 15 British) and 20 new standard-sized ones (10 destroyers each for the Germans and the British). We look at all of these designs in the book, and then present several sets of scenarios exploring how they might have been used in action. It’s a “historical study” using game components, like High Seas Fleet, rather than an alternative history with a background and a story arc. And it’s filled with new battleships and some other new vessels as well. Germany receives three new classes of battleship, with four examples of each class. The L1 battleship was designed in April 1916 as an improved Bayern, with the same armament and armor, but considerably longer (220 meters for the new ship, compared to 183 meters for Sachsen, the longest of the previous class) to allow larger machinery and give her finer lines for better speed. Shortly before his forced resignation in the spring of 1916, Grand Admiral Alfred von Tirpitz established a committee to study new ship types needed by the fleet in light of wartime experience. Along with the proposal for a faster Bayern, they also requested one with improved main armament but the same speed and protection. After looking at and rejecting idea to move to a triple turret with three 15-inch (380mm) guns, the architects offered design L2, with three turrets (the same as those fitted to Bayern, with two guns apiece) stacked aft in a progressive super-firing arrangement – Turret E sat at deck level, Turret D fired over Turret E, and Turret C fired over both. German thinking changed after the Battle of Jutland on the last day of May 1916. After years of accepting smaller-caliber main guns in exchange for greater protection, the committee now asked for a ship with both excellent armor and main guns larger than those of the British. Kaiser Wilhelm II weighed in with his own opinion: he did not care what form of battleship the committee chose, as long as one of them was named Pommern to honor the pre-dreadnought lost with all hands at Jutland. The designs submitted varied chiefly in the speeds achieved, and the greater size required for the machinery to drive a faster ship. For Jutland 1919 we chose the smallest variant as the most likely to be approved for construction; even then, this “small” option displaced 42,000 tons on a hull 235 meters long. She would have carried eight 16.5-inch (420mm) guns in the usual four-turret arrangement. Along with battleships, the committee also looked at battle cruisers – Tirpitz insisted that Germany continue to build such ships even as the difference between battle cruisers armored on the same scale as battleships and battleships given the same speed as battle cruisers had dwindled to nothing. This was an important political point: the German Naval Law provided for battleships and cruisers, and wiping away one type risked wiping away that type’s funding. And so we’ve got the big GK2 battle cruiser, one of three alternatives presented in April 1916, with eight 15-inch guns and making 29 knots. After Jutland, the committee sought a combined type now style a “large fast warship” and the set includes one example of Tirpitz’s Nightmare, the 30-knot GK4541, displacing 45,000 tons. And we have cruisers. There are two variations of the fast armored cruiser sketched in the weeks after Jutland, one with ten 8.2-inch guns and one with twenty 5.9-inch guns. Plus two variations of the so-called “fleet cruiser” (a single-purpose light cruiser, as opposed to the “colonial cruiser” or the dual-purpose types built previously), one with 5.9-inch guns and one with 8.2-inch guns. Finally, for the High Seas Fleet at least, we round out the class of huge Type 1916 destroyers presented in Jutland, 2,400-ton boats carrying 5.9-inch guns. John Jellicoe, commander of the Grand Fleet, made clear his preference for more ships bearing 15-inch guns even at a lower fleet speed than those with new weapons like the 18-inch gun or the proposed 16-inch gun, that might take longer to enter service. What he did request was a fast armored cruiser armed with a new-model 9.2-inch gun, and we have this ship in our Jutland 1919 set. Jellicoe and the German officer who suggested such a ship for the high Seas Fleet, Vice Admiral Georg Hebbinghaus, appear to have reached their conclusions independently, without knowledge of the other’s proposal. And for all of these new ships, we have new scenarios. Like High Seas Fleet, they’re crafted to present situations in which such ships might have been used rather than form a comprehensive alternative-history story arc. They’ll get plenty of use in future alternative-history supplements, in situations like the U.S. Navy’s Plan Black, and we’ve speculated that modernized versions of all these ships would see service in the High Seas Fleet of 1940 in Second Great War at Sea: The Cruel Sea. 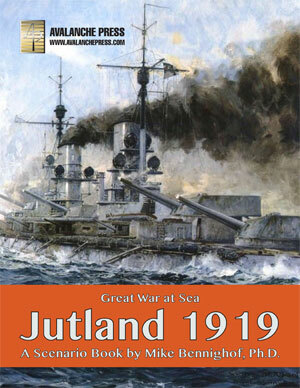 But what’s going to make Jutland 1919 a must-have source of fun is the set of Jutland 1919 scenarios: massive fleet battles in the North Sea including all of the British and German dreadnoughts from the Jutland core game plus High Seas Fleet plus Jutland 1919. This is how real men and real women play wargames.